You work hard for your money. And our checking accounts make it easy for you to manage your money – without all the fees. Remarkable Checking earns more and it's free! There’s a reason we call it Remarkable Checking—it comes with remarkable benefits. We believe our members should be rewarded. On top of 1.35% APY*, look below for the amazing benefits we have for you when you choose this account. Our Simplicity Checking is… well, simple. You’ll earn interest on your account balance, and as long as your balance doesn’t fall below $300 during the month, you’ll have no fees. There are no requirements about eStatements, logging into Internet Banking, or how many electronic deposits, withdrawals or debit card transactions you make. With MyOCCU Online and Mobile banking options, managing your money at OCCU comes with 24/7 convenience. We all know it's important to save. 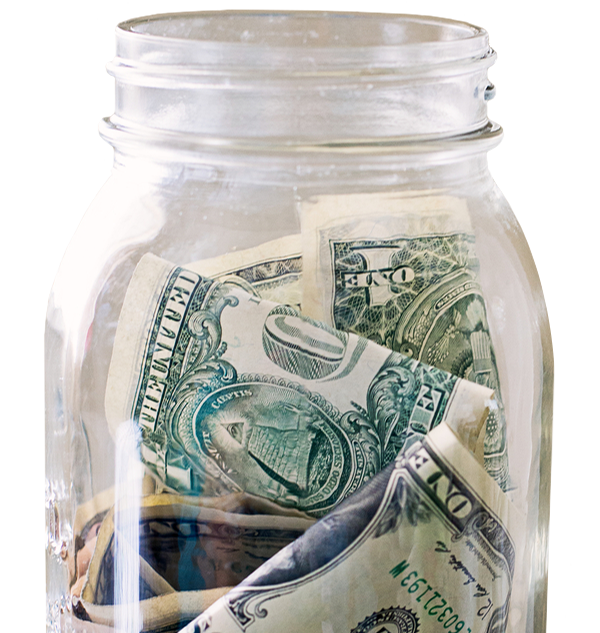 Because we want to make saving even easier for you, we offer the OCCU Change Jar savings program. Everyday purchases on your OCCU debit card can put money in your savings account! We’ll round up your transactions to the nearest dollar amount and automatically transfer the difference of your day’s purchases from your checking account to your savings account. If you’d like to participate and you have an active OCCU checking account, savings account and debit card, give us a call or stop by your local branch to enroll in Change Jar. It adds up. A new way to pay. No wallet required. At OCCU, we offer digital payment options to meet your mobile needs. Whether you prefer Visa Checkout, Apple Pay,R Samsung Pay and Google Pay, all of our debit and credit cards are compatible. OCCU digital payment options - make shopping simple, secure and private. We can help save you the inconvenience and expense of a declined payment or returned check. Talk to us today about taking advantage of one of our overdraft protection options. OCCU debit cards make all your purchases easy and secure. Pay for everything, big or small, in person and online; even your monthly bills. Plus you can access cash back at most retailers, and they're free with OCCU checking accounts. * Foreign ATM fees charged by non-OCCU and non-CO-OP financial institutions for the use of their ATMs will be automatically credited back to your account by OCCU at the end of the statement cycle. This credit is subject to meeting the Qualifying Factors. Statement cycle = first day of the calendar month to the last day of the calendar month. Example – May 1 – May 31. **1.35% annual percentage yield offered on Remarkable Checking applies to the first $20,000 and .20% APY on balances greater than $20,000 subject to the following qualifying factors (the “Qualifying Factors”) being met during each statement cycle: i) 12 debit card transactions must clear through your account during the cycle; ii) one direct deposit or other ACH credit or withdrawal must clear through your account during the cycle; iii) one login to Internet Banking or MyOCCU Mobile during the cycle; and iv) maintain active enrollment in eStatements during the cycle. If one or more of the Qualifying Factors are not met, you will receive default interest of .05% APY for that statement cycle. APYs effective 01/01/2019 and subject to change at any time. Fees could reduce earnings. *** If balance falls below $300 at any one time during the month, there will be a $5 Account Service fee.